Maffra & District Historical Society Inc. The Emirates Melbourne Cup Tour will be in Maffra next weekend. Since 2003 the Emirates Melbourne Cup Tour has provided rural, regional and metropolitan communities across Australia and New Zealand a chance to experience the magic of this iconic trophy. There will be an afternoon viewing of the Cup at Duart between 2-5pm on Saturday 12th of October. Entry will be a gold coin donation with a light afternoon tea available. Apart from the Cup being on view,there will be local racing memorabilia on display, a raffle with tickets to the Sale Cup to the winner and an address by an ambassadoor from Victorian Racing Club. During the evening there will be a Cocktail party from 6.30-8.00pm at Duart. Tickets are $25 per head which includes a light supper. During the evening the raffle will be drawn, heats and a final to a human powered horse race will be also be held. The Maffra Rotary Club invites everyone to attend one of these events. 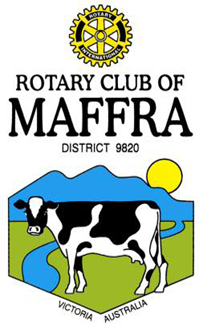 This is a major fund raiser for the Maffra Rotary Club youth programs.Further information can be obtained from Cath Noble on 0427149253 or Dianne Honey on 0413569954 or speak to a Rotarian in Johnson St on Thursday 10th October.